Students of Resonance Commerce & Law Program Division (CLPD) Kota, Jaipur & Indore Centres performed exceptionally well in CA-CPT (June-2017) & CA-Final (May-2017) results, declared by the Institute of Chartered Accountant of India (ICAI) on 18th July, 2017 at 2:00 p.m. In CA-CPT (June-2017), Total 121 Students from Resonance CLPD got selected in the exam, of which, 82 students were from Kota Study Centre, 21 students were from Jaipur Centre and 18 students were from Indore Centre. VAIBHAV JAIN topped Resonance with 182 Marks out of 200. 29 Students secured 150+ Marks in the exam from Resonance CLPD. 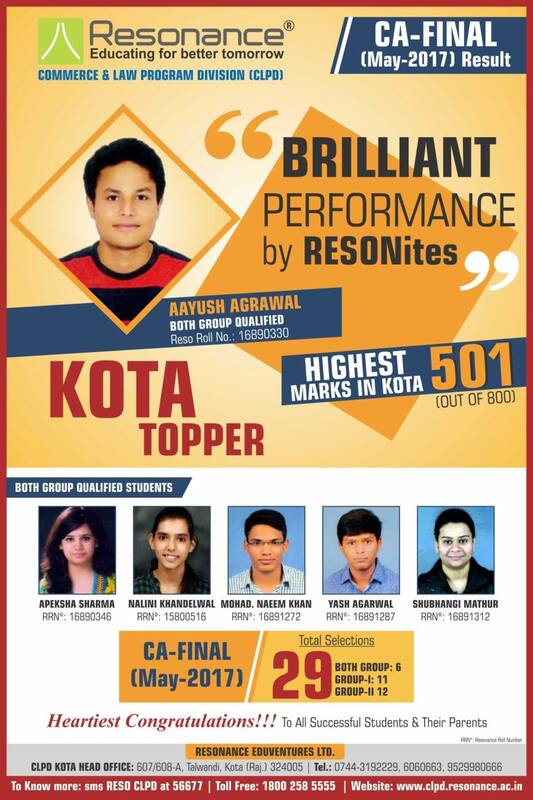 In CA-FINAL (May-2017) Result also, Resonance CLPD students performed brilliantly. Total 29 Students got selected in the Exam. Total 6 Students MOHAMMAD NAEEM KHAN, YASH AGARWAL, SHUBHANGI MATHUR, NALINI KHANDELWAL, APEKSHA SHARMA, AAYUSH AGRAWAL cleared Both Groups.